The Tight Tan Slacks of Dezso Ban: Joseph Curtis Hise - "Daddy of the Squat"
During the month of September, 1972, one of the most colorful, inventive and controversial personalities in the weight world died – Joseph Curtis Hise. It was during the early 30s that Joe Hise first started training. At this time he just couldn’t gain over 200. He read about the squat in Mark Berry’s magazines. Hise gave it a try. By doing the squat, press behind neck and the curl, in just one month he gained 29 pounds, tipping the scale at 229! He continued experimenting along this line and finally reached a bodyweight of 298, with an arm measurement of 19 inches, a chest of 56 and thighs of 33 inches. Even today such girths are considered fantastic but in those days they were simply beyond comprehension. 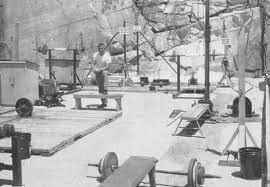 He wrote letters to editor Mark Berry outlining all the gains he was making, and his letter in the 1932 Strongman actually started a squatting fad that served to help hundreds of striving lifters who before were unable to gain weight or increase their power. One day when Joe started to work out he found that someone had used his squatting bar for a crow bar and had bent the darn thing. Since no other bar was available, Joe had to use that bent bar to do his squats. To his surprise the bar felt better across his shoulders; there wasn’t any pressure and the bar didn’t roll. 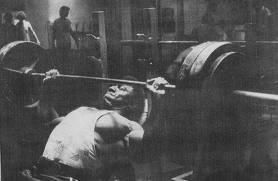 He reasoned that a cambered bar was the ideal thing for heavy squats and later wrote about it. 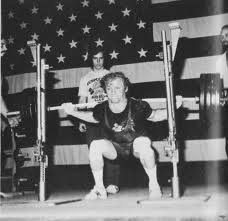 Cambered bar squats became very popular with squatters after that. Before we go more into Joe’s personal life, let’s look at the squat and how Hise used it to gain bodyweight and power. He found that if a man would take a weight and do 20 reps for just one set at each workout, he would gain weight. The first 10 reps should be done in the “usual” way but after the 10th rep one should take three deep breaths between each squat. After one has completed 20 reps one should feel like he had just run two miles at record speed. By squatting in this manner gains of three inches around the chest and 15 pounds of bodyweight in one month was not unusual. And remember, this was done without today’s miracle supplements. Experimenting upon himself and friends, Hise found that the exercise indeed did help to add size to the chest, increase appetite and gain bodyweight. He found that very heavy weights must be used if the movement was to be effective. Soon after Hise and his pupils were using in excess of 700 pounds in this exercise and making rapid gains. Hise knew that the deadlift worked hand in hand with the squat, but Joe never appreciated a stiff back. He again used his inventive mind and came up with another addition to exercising – the hopper deadlift system. Joe found that if you bounced the weight off wooden racks which were raised about two inches off each end where the plates hit, the strain on the back was greatly relieved and much heavier weights could be handled. He loved to read and was a fan of the Old West. Joe liked to visit friends by using the freight train as means of transportation. To demonstrate his power once while visiting Andy Jackson, he made a 700 pound deadlift without a warmup, at a time when the this weight was well above the accepted record. He, of course, was a very able writer and wrote articles for such publications as Vim, Vigour. Strong Man, Iron Man, etc, His friends, and even some top pupils, were the top names in those days and John Grimek was one of his best friends. The was Leo Murdock, Earl Stroudt, Dr. George Kelling, Lew Parker, Ted Edler, Tom Bruno and many, many others remembered only by old-timers. Hise was a big fan of Grimek and trained with him many times. When Grimek was down in Urbana, Illinois, only a short distance from where Hise lived in Homer, he came up to visit Grimek and urged John to spend the weekend with him and his family. Grimek to this day remembers the unusual training quarters that Joe had in those days, and he always mentions that for such a big man Hise moved faster and lighter than most lightweights. Way back in March of 1956 I sent a letter to Joe Hise and enclosed a dollar to help pay the postage. Two weeks later Joe’s letter arrived with the dollar enclosed, saying that he didn’t want any money, only that the reader use the information. To quote from that letter, he wrote, “The reliable deep knee bend is the bulk and power maker, preferably 20 reps for most men. One should use heavy weights and the thing to do is get 20 squats performed. The first 10 should be finished in 10 breaths, then one should take three to three to five breaths between the next 10,” he suggested. “I train three times a week when trying to gain weight, and twice a week when trying to increase power,” he advised. Hise wrote hundreds of letters to lifters across the continent and asked only that the advice he gave be put to use to help the growth of the barbell game – a very unselfish motive. He enjoyed living in the Western States and performed hard labor all his life. Joe worked in coal mines, as a lumberjack and prospected for uranium for years. Often he worked double shifts, saved his money and then layed off so he could exercise, eat and sleep. By this mode of living he was able to weigh what he wanted at any given time. I think the final chapter of Joe Hise’s life begins two years ago. This mountain man started to grow older and was still living alone in a cabin, working at lumber cutting. Time had taken its toll and worn this rugged man down. He became ill. This illness along with some personal problems and an old injury suffered in a job exacted their punishment. His fellow workers talked him into seeing a doctor who put him in a hospital and insisted on him losing weight until he was skin and bones. When they got done with him he weighed less than 190 pounds and was a walking wreck. It was in August of 1972 that Joe knew he was a very sick man and had been weakened by the medical attention he underwent. Joe decided to buy a pickup truck and set out to visit his friends across the country for the last time. It was a Friday afternoon that I received a call at work from my wife informing me that Joe Hise was at our house. I rushed home and when I saw the man I was shocked. This once rugged, strong individual was now but a shadow of his former self. I couldn’t believe my own eyes. We exchanged greetings, talked about a number of things and I found that mentally he was as sharp as ever, but physically – he was not. We took a fast trip to visit Andy Jackson, a long-time friend of Joe’s. During our conversation what most impressed me was the strong courage and his positive outlook on life that he had. He was full of plans to regain his health, to write and enjoy life again. Hise was human and he said that he deeply regretted not trying harder to become a lifting champion instead of going off to Colorado to wander across the land. He said that he was sorry he never married as he felt a good woman could have made the difference in care and meals that might have kept him healthy and helped him regain his health during the dark and lonely days of the past two years. When we said goodbye I had the distinct feeling that this would be the last time I would see him – and it turned out exactly that way, much, much to my regret.